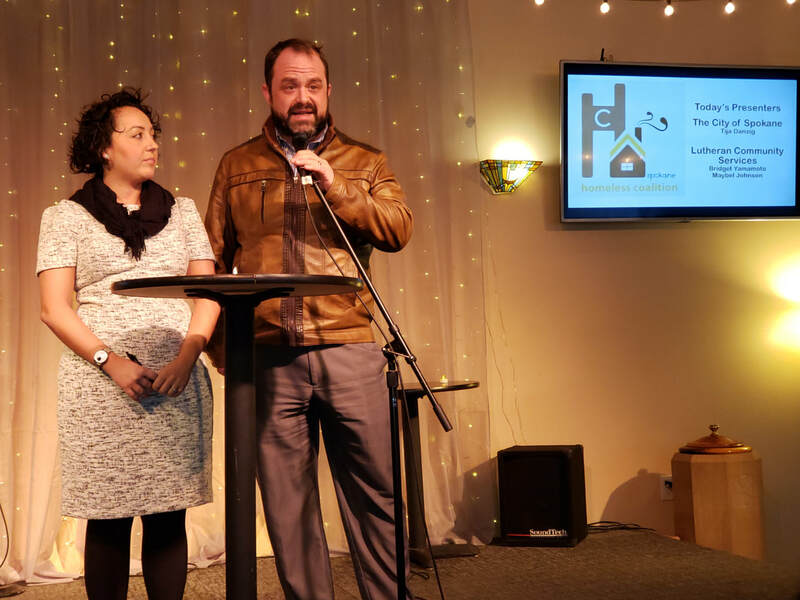 "My Road Leads Home: The Spokane Homeless Connect"
​At the Spokane Homeless Connect last January a video documentary crew began work on a documentary about the Connect. That documentary is nearing completion and we'll be announcing a "Premiere" event soon. In the mean time, the producer has released the enclosed a 6-minute clip from the 1-hour documentary. 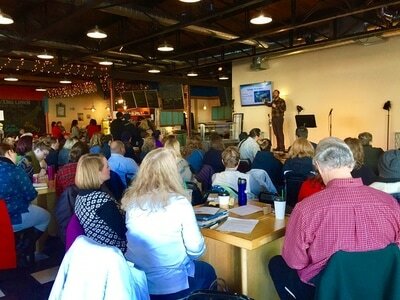 Our thanks to everyone who filled up The Gathering House for the April meeting of the Spokane Homeless Coalition . The April meeting was a joint meeting of the Spokane Continuum of Care Committee and Spokane Homeless Coalition. The meeting featured working breakout groups by subcommittee (Youth, Family, Singles, Seniors, Veterans) facilitated by Committee members of the Spokane Continuum of Care (CoC) Committee. Participants had the opportunity to give input on the City of Spokane's 5-Year Plan To End Homelessness. Again the Leadership Team would like to thank everyone who helped make the day success! Joe Ader is Coalition Chair, Executive Director of Family Promise of Spokane and the panel moderator. Kelly Keenan currently works as Director of the Community, Housing and Human Services (CHHS) department at the City of Spokane. The CHHS department facilitates community-based strategic planning for the provision of public services and capital investments that benefit low and moderate-income members of the community including those experiencing housing crises, provides grant funding to community partners in alignment with strategic planning efforts, and reports to funders and the community-at-large on the outcomes of these public investments. Kelly has worked at the City of Spokane for 8 years in a variety of capacities related to community development and human services, including grants and contract management and data system administration. He holds a Master’s Degree in Urban and Regional Planning from EWU. Mark Richard is President and CEO of the Downtown Spokane Partnership. Born and raised in Spokane, Mark graduated from Eastern Washington University with a degree in Government. He is a former Realtor, spent 5 years serving as a Government Affairs Director for the Association of REALTORS and Spokane Home Builders. He served two four-year terms as County Commissioner on Criminal Justice Reforms, economic development, regional collaboration among jurisdictions, and championing services to care for those who genuinely cannot care for themselves. Jan Simpson is currently the Chief Executive Officer of the Spokane Eye Clinic. Jan is a Certified Public Accountant with over 20 years of Health care related services Administration. Jan is a U.S. Army veteran, a graduate of Gonzaga University, and a native of Spokane. Jan joined the City of Spokane and Spokane County Continuum of Care (CoC) board in the summer of 2018 as the Business Community Representative of the board. Kate Burke grew up in Spokane and loves this city and the people in it. After working for AmeriCorps VISTA, starting her own non-profit, and working in the state legislature, she became a Spokane City Council member for District 1 in 2018. Jessica Winfrey was born and raised by in Spokane by two local business owners. Jessica entered the workforce at the early age of 14 and is now Manager and Director of Operations for Sweet Frostings blissful bakeshop. Jessica works closely with local service providers including Catholic Charities, UGM, Lutheran Community Services, and the YWCA. Fawn Schott is President & CEO, Volunteers of America Eastern WA & North ID. Volunteers of America focuses on providing safe housing and shelter for homeless youth, veterans, women and single men. The organization operates the Crosswalk teen shelter, Hope House for women, and housing for homeless veterans and disabled adults, among other programs. She has an MA degree from Washington State University in Project Management and a BA in Education. She serves on the WA State Children’s Justice Taskforce, the Business Improvement District Advisory Board and is the Vice-Chair of Spokane’s Continuum of Care Board and focuses on influencing dynamic system, change and innovative solutions to complex homeless issues in Spokane County. 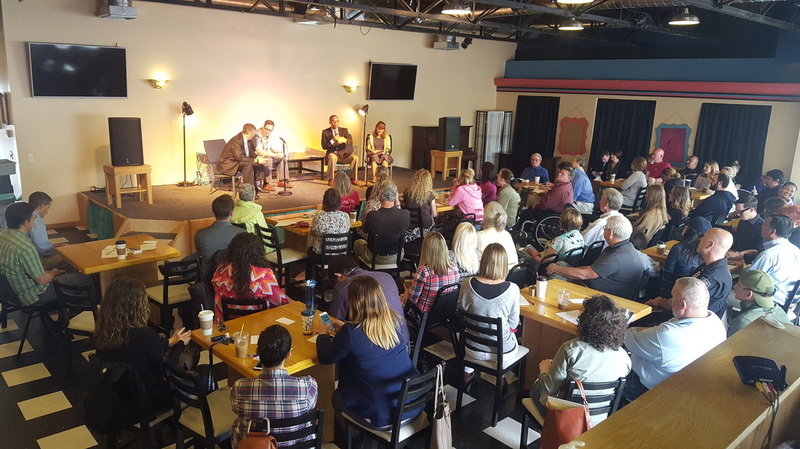 The February meeting of the Spokane Homeless Coalition featured a panel discussion on the effects of the recent Government shutdown on the service community and our clients. Panelists included people from City of Spokane, Spokane County, Spokane Housing Authority, and the Washington State Tenants Union. We experienced record attendance. The Leadership Team would like to thank all of our panelists, and everyone who braved the weather to come and engage in some great interaction. As always, the meeting featured great information, amazing networking and more collaboration between agencies! Two great presentations at our January Coalition Meeting. Tija Danzig and David Lewis from the City of Spokane's Community Housing and Human Services updated us on the upcoming 2019 "Everybody Counts" Point-In-Time Count. And a team from Lutheran Community Services presented on the issue of Human Trafficking (in honor of Human Trafficking Awareness Month). Great presentations and great attendance. Thanks to all! Remember: Warming Centers/Shelters are functioning and are asking for help, particularly user-friendly food items AND clean dry socks. 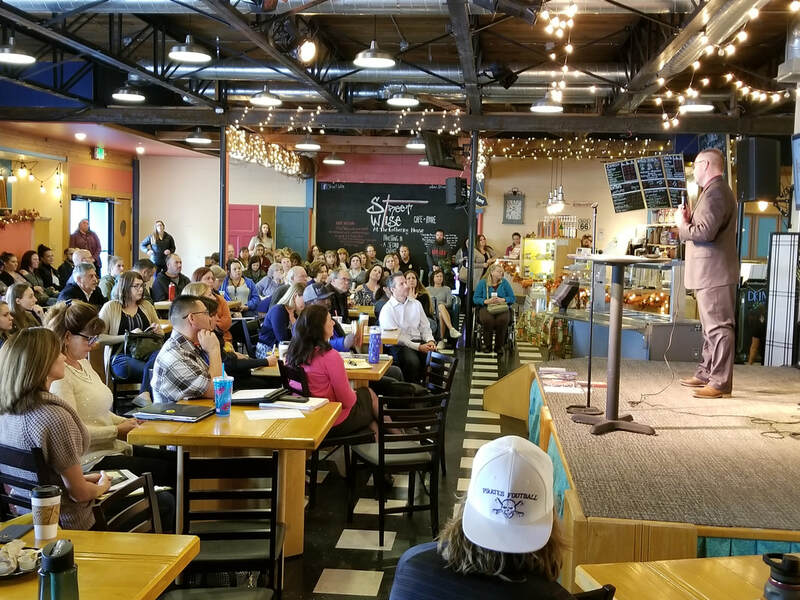 Also, The 2019 Spokane Homeless Connect is coming up on Wednesday, January 30th at The Salvation Army. Volunteers are needed for a wide variety of Connect tasks. For more information on volunteering contact Call Sabrina Bukowski @ 509.710.1471 or Email sbukowski@chas.org Visit our Connect Page to learn more about the Connect. PIT Count Heads-Up. David Lewis and Tija Danzig with the City of Spokane will update us on preparations for the upcoming Point-In-Time Count. Winter Clothing Drive. This is an opportunity to bring socks, gloves, hats and other winter apparel. This year’s donations will go to the Point-In-Time clothing drive being coordinated by the City and which will be distributed at the Connect in January. 2018 Recap. This is your opportunity to share with everyone something special about your organization; things like the best thing that happened to you and/or your agency this past year, or something special you’re looking forward to in 2019. There will be a Sign Up sheet at the meeting for everyone wanting to share (because we give everyone a little extra time, so space will be sort of limited). Networking. The Coalition is growing and there are many new faces. We'll have networking games to help everyone break the ice and get to know someone who may be new to the Coalition. Networking and getting to know new people is part of how this Coalition does such an amazing job of solving problems and serving others. Networking isn’t time spent, it’s time invested! Elections. Elections for the positions of Coalition Chair and Media Liaison will be held. Don’t want to miss that! Plan to join us Thursday, December 6, 9:00AM at The Gathering House (Post & Garland) for our December holiday gathering. The Leadership Team wants to thank everyone for a great November meeting of the Spokane Homeless Coalition. In honor of Veterans Day (November 11), our presenters brought us all up-to-date on what our community is doing to serve the needs of our Veterans. 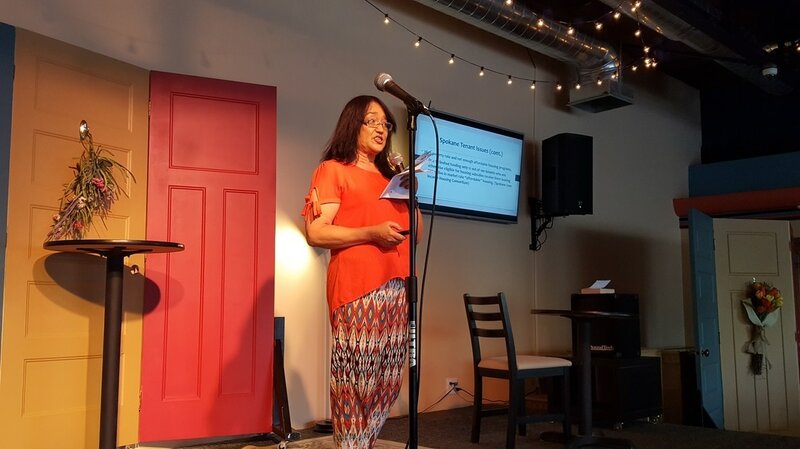 Cathrene “Cat” Nichols is a U.S. Army Veteran and the Eastern Washington Strategic Operations Manager for Washington State Department of Veterans Affairs specializing in regional strategic and multi-jurisdictional partnerships. She serves as the Director of the Spokane County Regional Veterans Service Center in Spokane, WA, and is a member of the board of directors for the National Coalition for Homeless Veterans and the Community Veterans Engagement Board. Dean Salvio served for 12 years in Europe with the USAF, Combat Security Forces, and as Fairchild’s first Family Readiness Program Manager from 1995 to 2001. Dean currently serves as the General Manager of Homeless Transition Services for Goodwill Industries of the Inland Northwest, providing community programs including Supportive Services for Veteran Families, Housing and Essential Needs, Re-Entry, and the SOAR Program. 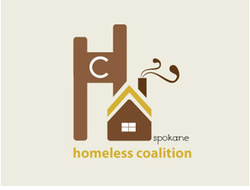 The October Meeting of the Spokane Homeless Coalition took place on Thursday, October 4, 9:00AM at The Gathering House (corner of Post & Garland in Spokane). Two major items dominated the meeting Agenda. Presentations For National Domestic Abuse Awareness Month. Nicole Nimens of the YWCA, gave a first-rate presentation on the basics of domestic violence and how to identify and respond. Sergeant Jordan Ferguson, a 19 year veteran with the Spokane Police Department who gave an overview of how his Domestic Violence task force works with the YWCA to address domestic violence. Sgt. Ferguson told the nearly 125 attendees at the meeting that 1) Domestic Violence is the #1 call that SPD officers respond to, and 2) he has reviewed 3,000 domestic violence reports YTD. Service Changes At House of Charity. Service changes at House of Charity affect everyone who works with the homeless community, especially in the downtown core. Heather Schleigh, Director of House of Charity, updated us on the scale-back of services at HOC. The good news is that HOC remains open and continues to house 175 homeless residents (125 men & 50 women) every night! The September meeting was held on Thursday, September 6th, 2018 at 9 am at the Northeast Community Center (instead of our regular meeting place, The Gathering House). Attendance was excellent, with a larger turnout than usual! We hosted county and state candidates. Coalition Chair Joe Ader acted as our moderator and did a great job of keeping the focus on homelessness and and related issues. Our thanks to all of the Candidates who participated! Come join us for our October meeting on Thursday, October 4, 9:00AM at The Gathering House! Kevin is the One-Stop Operator at the WorkSource Spokane One Stop Center (American Job Center). He oversees the operations, customer flow, continuous improvement, and professional development training for 8K annual customers and 65 staff in the center. He is a 25 year veteran of the United States Air Force and holds master’s degrees in Organizational Management and Educational Theory. Alex is a Spokane local and Community Health graduate from Eastern Washington University who is passionate about helping youth and young adults discover their own career passions and potential to achieve their goals. When not recruiting and interviewing students for Job Corps, she can be found at the lake or exploring new cities. Job Corps is a free, residential education and career training program that has been helping low-income, homeless, and at-risk youth achieve employment and stability for over 50 years. Cascades College & Career Academy is a new pilot program, under the Job Corps umbrella, that offers all of the traditional Job Corps benefits plus high-demand career pathways in Healthcare and Information Technology with tuition-free college opportunities. ​Our September meeting is set for Thursday, September 6th, 2018 @ 9:00 am at the Northeast Community Center, different from our regular location at The Gathering House! Come at 8:30 for networking opportunities (but no coffee this time unfortunately)! 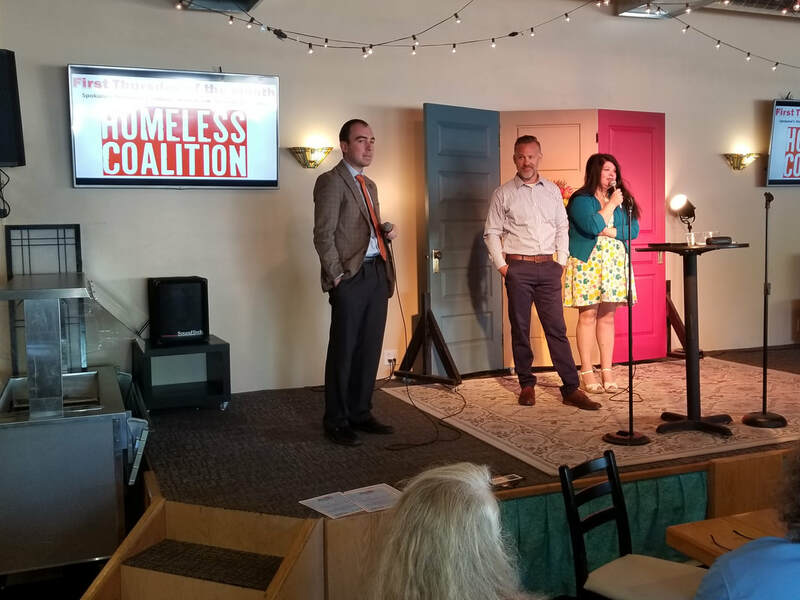 We will be hosting candidates running in local and state elections to speak to the Coalition about their views on and surrounding homelessness. Ryan is a financial lead worker in the contact center. He has worked in both the contact center and the community service office and has been with DSHS for about 5 years. Natalya is a trainer in the contact center for the Community Services Division. She has been with the state for about 5 years. Israel is a Lead Navigator with Better Health Together’s Navigator Network program. He received his Master of Health Policy and Administration degree from Washington State University in 2015. Soon after Israel discovered his passion in assisting low income families with their billing and insurance needs through a Federally Qualified Healthcare Clinic in Spokane. He has continued to assist individuals with their insurance needs at Better Health Together over the past 9 months of employment. Justin is a graduate of Whitworth University and has worked with Better Health Together for the past two years. His role is the Senior Program Manager with the Accountable Community of Health team and has responsibilities around Care Coordination Development and outreach to the Northeast Tri County area. Come at 8:30 for networking opportunities and coffee! Presentations will surround the topic of Employment. Come at 8:30 for networking opportunities and coffee! John is the Assistant Director of Homeless Youth Programs, and oversee the program development and budgets of five programs: Crosswalk, Alexandria’s House, Aston-Bleck Apartments, Youth in Transitional Housing, and YouthREACH. He has been working in homeless youth services at Volunteers of America for a little over 8 years and he is a trainer in Positive Youth Development, Residential Child & Youth Care Professional Development, and Leadership Development. ​Ryan Oelrich is the Executive Director of Priority Spokane, a collaborative organization which has identified addressing student homelessness as its current priority for Spokane County. Oelrich serves as the President of Our kids: Our business working to prevent child abuse, and is the founder of Spokane Sidewalk Games which employs area youth facing homelessness as it works to create “a community who play together so we stay together!” Oelrich also owns a nonprofit consulting business and works as a trainer providing mental health training for the State of Washington and others for the last ten years. Dr. Mark Terrell is the founder and Spiritual Director at Cup of Cool Water. 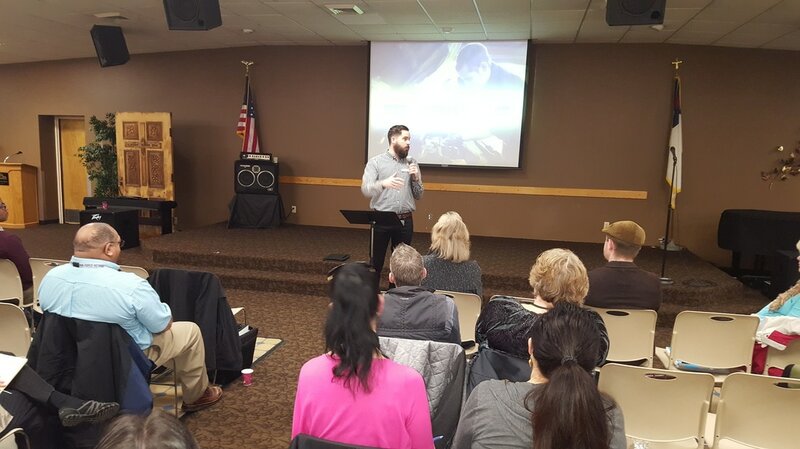 He has an undergraduate degree from Whitworth University in Psychology, a Doctorate of Ministry from Bakke Graduate University, and a Certificate of Training in Spiritual Direction. If you have attended a Coalition meeting within the last year you should receive an email with a survey that has the candidates listed- please take a minute to vote! Voting will be open one week from the time you receive the email. Pam is the Executive Director of the Spokane Housing Authority, and since starting there in 2013 she has made incredible changes to the voucher system, ensuring that more people were served and that the process was streamlined to serve them faster. Collectively, she has 28 years of experience in affordable housing administration, facilities management, and development. Because of her commitment to housing the community, Spokane developers have had greater success in building new housing facilities in order to increase the number of low income housing units available. What is the Continuum of Care Board? Those experiencing homelessness are provided services in the City of Spokane that target their barriers and needs to achieving housing stability. The CoC provides an abundance of services for those experiencing homelessness with support from local, state, and federal funding sources. Each year, the United States Department of Housing and Urban Development (HUD) awards CoC Program funding competitively to nonprofit organizations, states, units of local governments, and/or instrumentalities of state or local government, who can sub-grant with other organizations to carry out the grant's day-to-day program operations. Spokane is fortunate to have a strong group of partners and stakeholders to support this work. The CoC is governed by a Board made up of local government, service providers, stakeholders, and people who have experienced homelessness. The Board is guided by HUD and the United States Interagency Council on Homelessness (USICH) national goals in ending homelessness. The CoC Board is designed to promote community-wide planning, strategic use of resources for addressing homelessness, and to improve coordination and integration with mainstream resources and other programs targeted to people experiencing homelessness. The Board also provides community leadership to further our goals around improving data collection and performance measurement and, ultimately, tailoring our suite of services to address the challenges the community faces by utilizing our strengths and leveraging partnerships and community support. 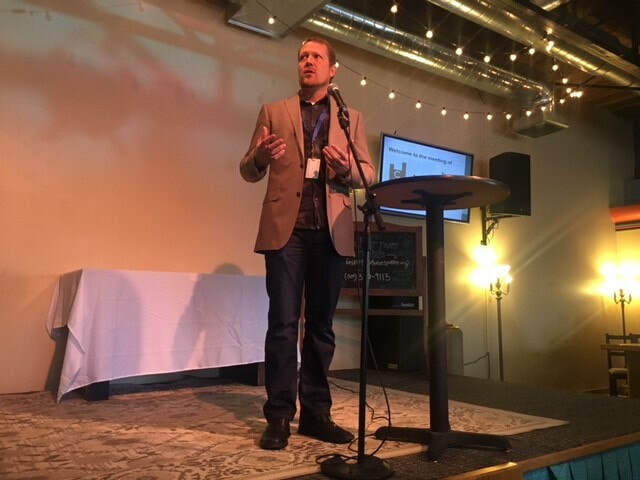 Ryan Oelrich is the Executive Director of Priority Spokane, a data-driven organization which works collaboratively to establish priorities for Spokane County. Since 2016 their priority has been to stabilize a growing number of homeless students in K-8th grade. Ryan also serves as the president of Our kids: Our business, an organization dedicated to the prevention of child abuse and caring for all of Spokane’s kids. The work these two organizations do intertwine in many ways, and Ryan will share their progress, obstacles they’ve encountered, and stories and lessons learned along the way. 1-5 pm at Gonzaga University's Cataldo Hall, 429 E. Boone Ave.
Angela Slabaugh holds a masters in social work from Tulane University in New Orleans and has served as the Executive Director of NAOMI for the past 5 years. 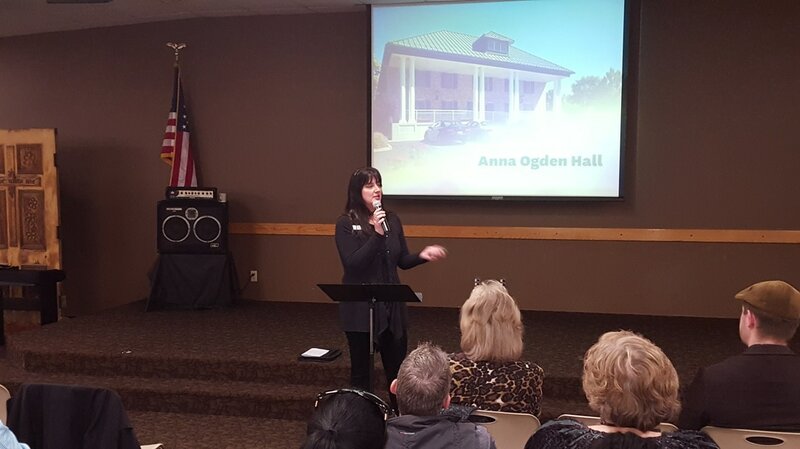 She currently serves as Vice-Chair of the Spokane Homeless Coalition and Chair of Spokane Baptist Association Homes which creates exceptional and inclusive retirement communities. Erik Larson is a dynamic leader in our community, serving as the supervisor of the Home Finders division of the Department of Child and Family Services which works tirelessly to identify safe, appropriate homes for children in the foster system. He has served on the NAOMI Board for the past 3 years and is currently the Board Secretary and overall champion for children in our community. Personal investment in recovery i.e. 60 days of outpatient, no contact orders, etc. Our next meeting will be held Thursday, March 1, 2018 at 9 a.m.
1. SHC Year In Review. Ryan Oelrich, our outgoing Coalition Chair, rode in on a snowman and gave us a quick review of our time together as a Coalition for past year. 2. A holiday "Sock Drive." We want to encourage everyone to bring and donate a new pair (or more) of unused socks which will be donated to the Family Promise/Open Doors Family Shelter. 3. Introductions. We officially introduced the newly elected Leadership Team (Joe & Olivia) and Ryan provided them with an assortment of items to help them in their upcoming year. Dr. Robert Zinke, Professor of Public Administration at Eastern Washington University College of Business and Public Administration. Molly Anselmo Sanchez, Director of Grants and Community Engagement at the Inland Northwest Community Foundation. Brian Myers, Vice President of Rural Health and Capacity Building at Empire Health Foundation. 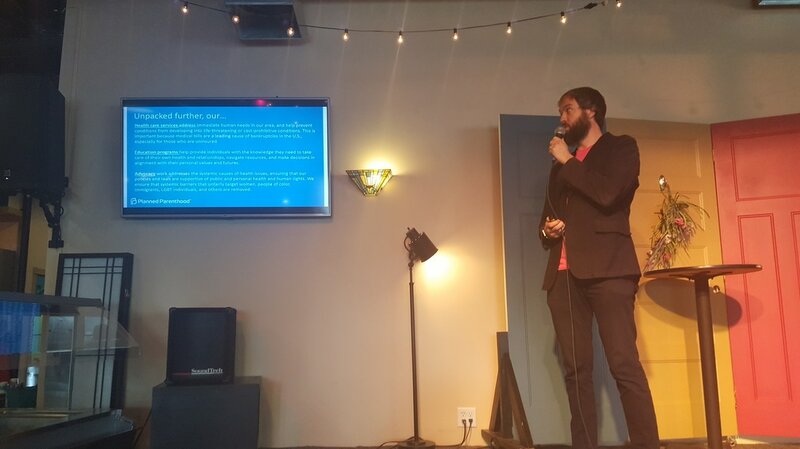 For those of you who were unable to attend, you will find a PDF file of notes from the meeting (prepared by Joshua Porter) below-right. Welcome to the October meeting of the Spokane Homeless Coalition! A large crowd heard from some great presenters! Dave Scott from Spokane Housing Authority and Director of HAP spoke on housing issues and brought us up to date concerning the number of vouchers that have been issued but cannot find a place to rent. Kay Murano from Spokane Low Income Housing Consortium discussed upcoming legislation that could affect homeless services in Spokane. 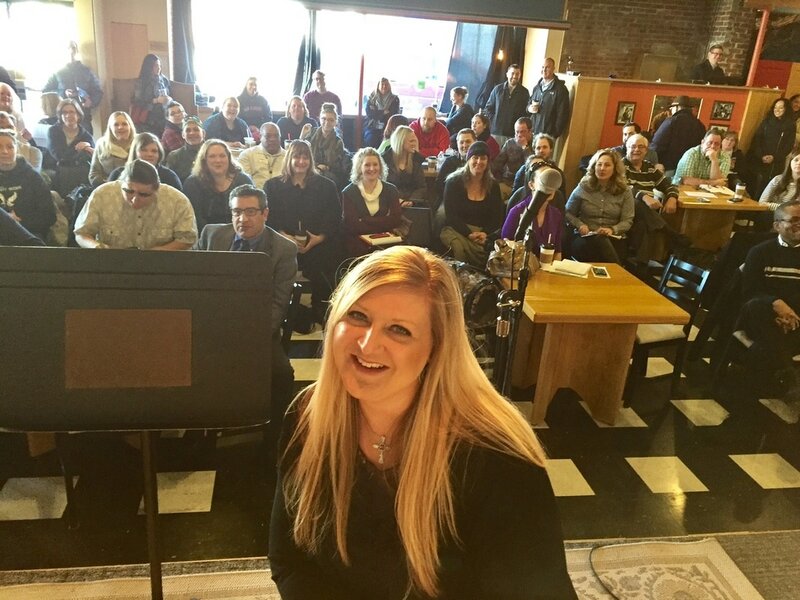 Spokane City Council Member Amber Waldref joined us to discuss the recent City Council Homeless Forum and issues which it highlighted. 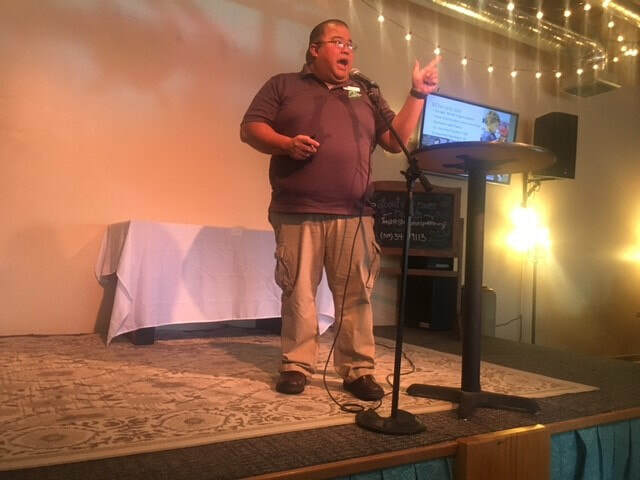 The September meeting of the Spokane Homeless Coalition featured Eddie Rodriguez with DSHS, presenting on the possibility and impact of reduce poverty by 50%; and Spokane Sidewalk Games (founded by Ryan Oelrich), which works to strengthen communities through play across Spokane County while supporting & employing homeless youth. Their presentation included a Youth Homelessness Panel Discussion with Sidewalk Games Youth Staff Arielle, Bale, & Brandon. Our Thanks to everyone for a great meeting! 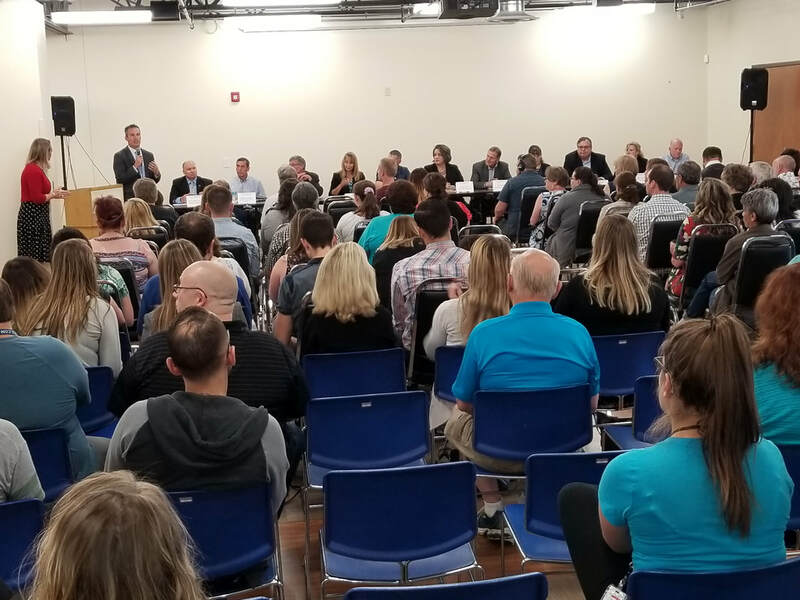 Welcome to the August meeting of the Spokane Homeless Coalition. 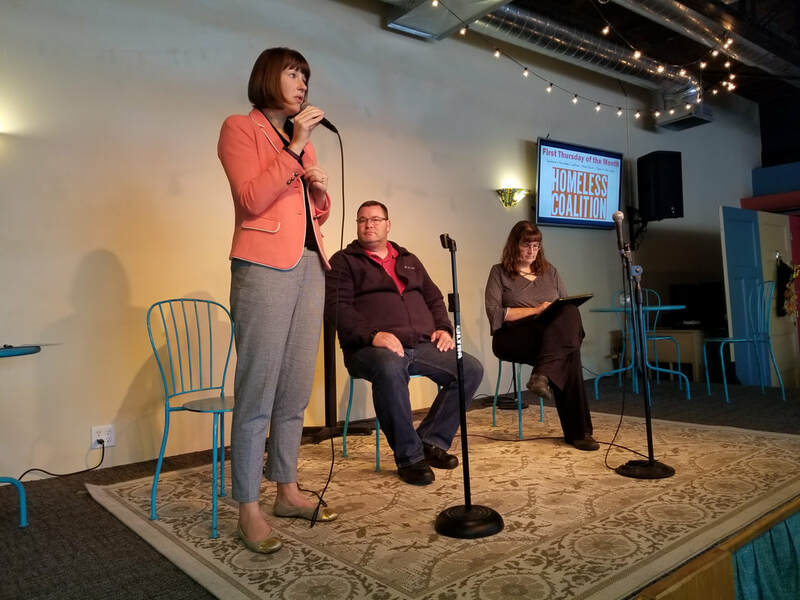 Our August presenters were Crystal Dawn Walker, Site Assistant Manager and Senior Services Empowerment Coordinator of Spokane Housing Ventures, and Steve Allen and Joe Ader filling us in on the great work of the Open Doors 24/7 emergency family shelter at Family Promise of Spokane. A big "Thank You" from your Leadership Team for a great meeting! The July Meeting of the Spokane Homeless Coalition took place on Thursday, July 6, 9:00AM at The Gathering House (corner of Garland & Post). Our presenter for the meeting was Blessings Under The Bridge. 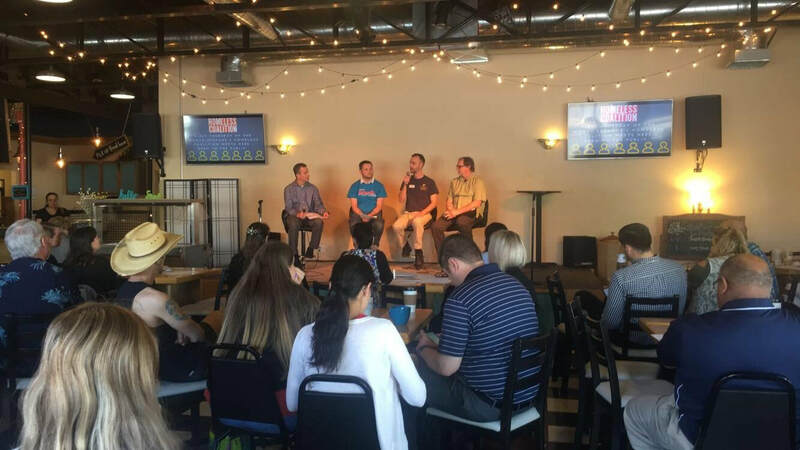 The Leadership Team wants to thank everyone who attended and participated, including Jonathan Mallahan from the City of Spokane who joined in the Q&A time following the presentation. A lot of great networking took place, too! Welcome to the June Meeting of the Spokane Homeless Coalition! It was another info-packed morning! The video to your left will give you a feel for what took place! 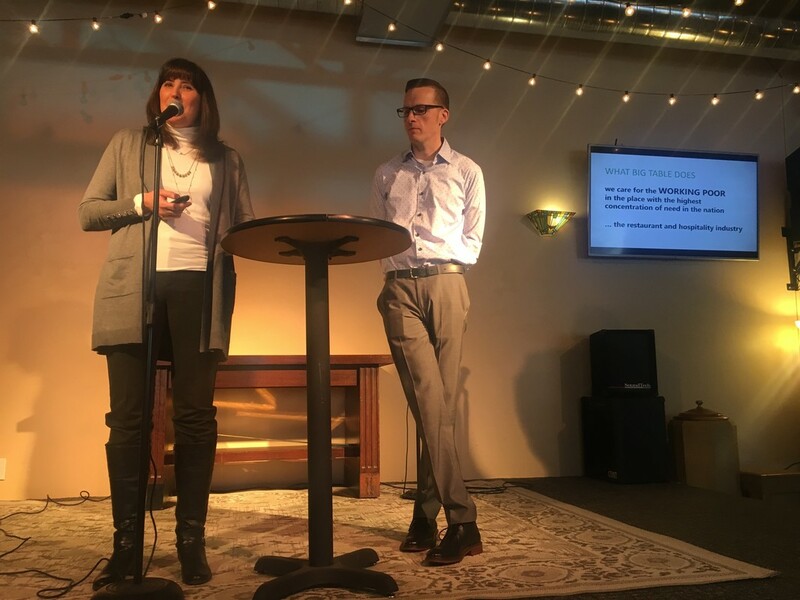 Matthew Davis from the City of Spokane, and Sarah Miller from Spokane Public Schools, updated everyone on the status of Spokane's involvement with the 100 Day Challenge To End Youth Homelessness. Also, Terri Anderson from the Tenants Union of Washington State gave a presentation on the status of challenges faced by tenants in today's tight rental market. And Paul Dilllon from Planned Parenthood updated everyone concerning the the services they provide in Spokane and Eastern Washington. The PowerPoint Slides use by each Presenter are linked below. Leadership Election. The Leadership team would also like to congratulate and welcome the newest additions to your Spokane Homeless Coalition Leadership Team: Angela Slabaugh, Executive Director of Hearth Homes, as our Vice Chair to replace outgoing Francis Adewale and Kay Murano, Executive Director of Spokane Low Income Housing Consortium, as our Administrator to replace outgoing Officer Bart Stevens. ​April's meeting of the Spokane Homeless Coalition was another outstanding gathering. Our attendance was over 100 (we lost count after 104) with a lot of new faces! Ryan Oelrich, our Coalition Chair (picture left), did his usual great job of facilitating the meeting. 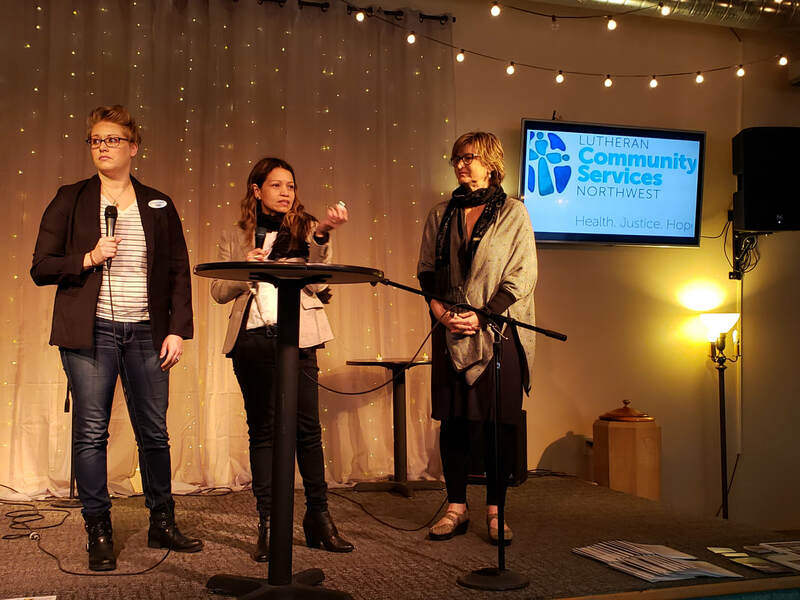 Shawn Stevenson, Executive Director of Life Services' iChoice (center), did a great job of presenting on the residential and support services they offer to women who are pregnant and homeless in Spokane. Cary Retlin, Executive Director for the Statewide Reentry Council (picture right), gave us all an education on the status affordable housing in our State. I think we were all taken aback when Cary related that a $100 increase in rental rates in an urban context produces a 6% increase in homelessness! That's why we sponsor these gatherings; because we all learn from each other! The Leadership Team would like to thank everyone for another outstanding Coalition Meeting! Our March Coalition Meeting took place at at the Union Gospel Mission. And even with the change of venue, our attendance was excellent (between 110 and 120 people). 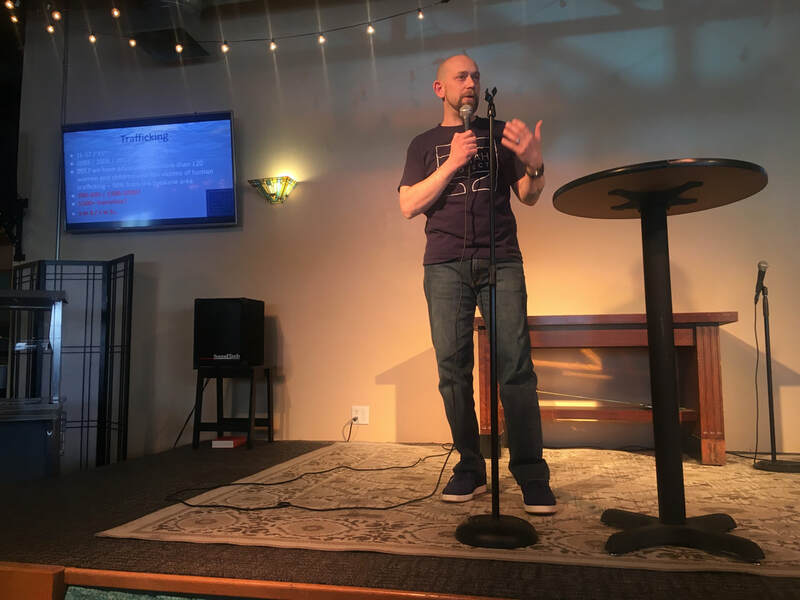 We heard from Phil Altmeyer and all of the UGM program managers, not only concerning recent policy changes, but concerning the many services they offer. Our thanks to UGM for hosting us. Our April Coalition Meeting will be back at The Gathering House on Thursday, April 6. The Leadership Team would like to thank everyone for an outstanding Coalition Meeting! 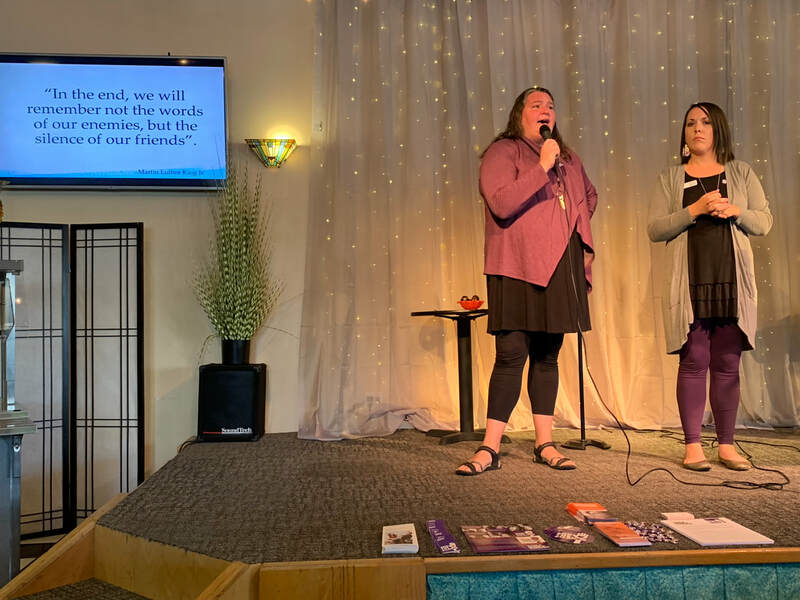 Our presenters included Jule Schultz from Spokane River Keepers who updated us concerning Homeless encampments along the Spokane River, and Layne Pavey from Revive Reentry Services who educated all of us on the challenges faced by people recently released from incarceration. We also had a record attendance of 140 people who are passionate about serving those in need throughout our community. 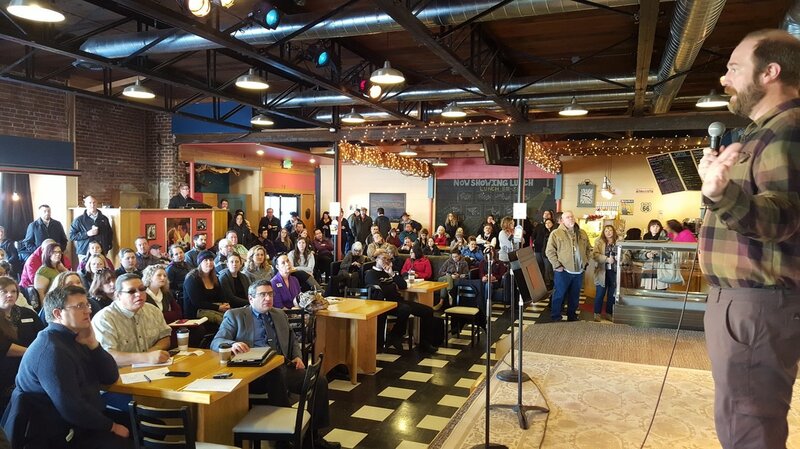 Our January Coalition Meeting was outstanding in both content and attendance. We heard from the SOAR Initiative (SSI/SSDI Outreach, Access, and Recovery) , a national program designed to increase access to the disability income benefit programs administered by the Social Security Administration (SSA) for eligible adults who are experiencing or at risk of homelessness and have a mental illness, medical impairment, and/or a co-occurring substance use disorder. We also received an update from David Lewis, HMIS Director for the City Spokane, concerning the upcoming 1-Day Count. First, Nicole Nimens and Jennifer Haynes of the YWCA's Alternatives to Domestic Violence Program will present on the topic of domestic violence. Nicole is the Domestic Violence Community Education and Outreach Coordinator for YWCA, and coordinates special events surrounding Domestic Violence in our community. Jennifer Haynes is Associate Director of Housing at YWCA, overseeing the DV safe shelter in the city as well as the city of Spokane Valley. She also oversees YWCA's various programs for transitional housing, permanent supportive housing and mobile advocacy. Second, Bill Kane and Ed Kennedy from the Spokane Center for Independent Living (SCIL) will present on the topic “Independent Living in Spokane from a disabled person's viewpoint.” SCIL advocates for people with disabilities who need various kinds of assistance, including those who are homeless or facing homelessness because they cannot find affordable, accessible housing. We will have our regular four (4) standing breakout groups (Veterans, Healthcare/Mental Health, Law & Justice, Housing & Nutrition). In addition, our 5th "Rotating Breakout" will be on the topic of REFUGEES. A team from World Relief, an agency which does extensive work with refugees both locally and nationally, will be present to facilitate this workshop. If you or your agency have questions or concerns involving refugees, this is an opportunity to explore this topic more in-depth with people who are deeply involved. Our Presenter for October was Lyndia Wilson, Division Director at Spokane Regional Health District. Lyndia gave us an outstanding presentation entited "Rallying around Data." Lyndia elaborated on the Missing the Foundation report on homelessness. 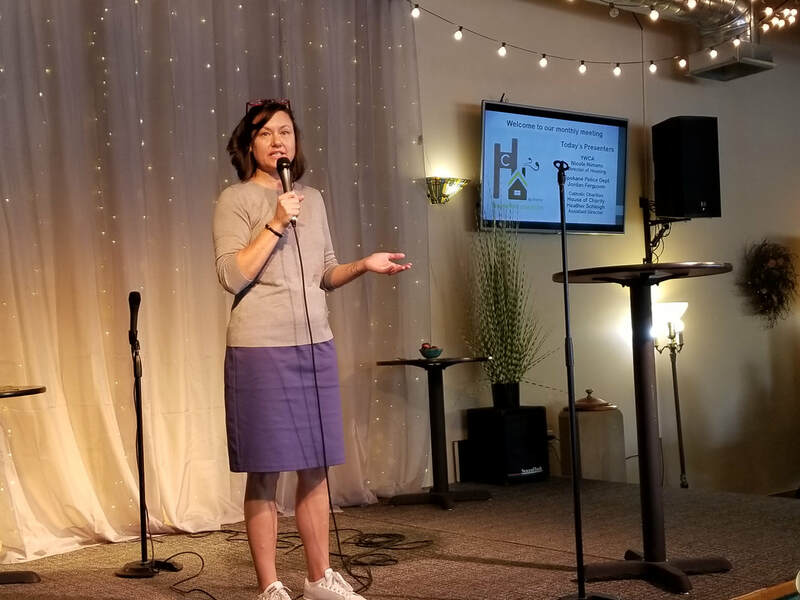 She explained how public health uses better data to create shared movement on a community issue such as homelessness, along with the results from publishing and distributing the homeless report. Lyndia had the unique ability to make "data" both interesting and relevant. Lyndia has graciously provided us with her PowerPoint file (posted below). Our September Coalition Meeting featured our Candidates Forum with Candidates for local and state-wide offices. The Leadership Team would like to express our thanks to all of the Candidates who participated, and to our Coalition Members for submitting a lot of great questions which generated some great discussions! We appreciate everyone's involvement. 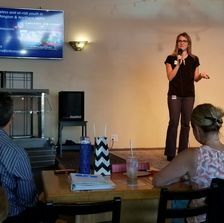 Our presenter at the August 4 Coalition Meeting was Stacey Chay who talked to us about "ACE's" (Adverse Childhood Experiences). Stacey is the Program Director for the Part-time MSW Hybrid program at Eastern Washington University where she received her MSW. Her practice interests include the following: behavioral health and addictions, trauma informed care, suicide assessment, management and treatment, law and ethics and policy. Below you will find the TEDTalk by Dr. Nadine Burke Harris which Stacey shared at the August Coalition Meeting. At our July 7 Coalition Meeting we were honored to have Spokane Mayor David Condon as our primary presenter. 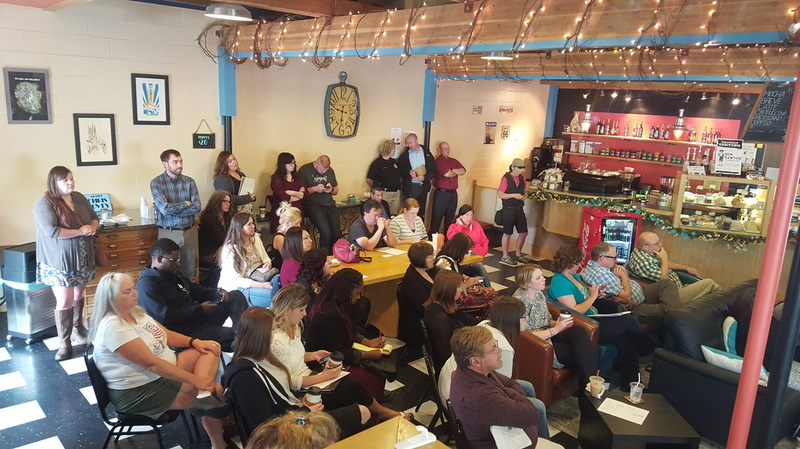 The Mayor spent nearly 45 minutes offering a wide ranging discussion of the City's efforts and plans to serve the homeless and marginalized throughout our community.​ We had record attendance of well over 125 people. Spokane Mayor David Concon with the Spokane Homeless Coalition Leadership Team. L-R Lieutenant Barton Stevens (SPD, incoming Administrator), Officer Jennifer DeRuwe (SPD, outgoing Administrator), Mayor David Condon, Francis Adewale (Co-Chair), and Maurice Smith (Media Liaison). Not shown, Ryan Oelrich (Chair). 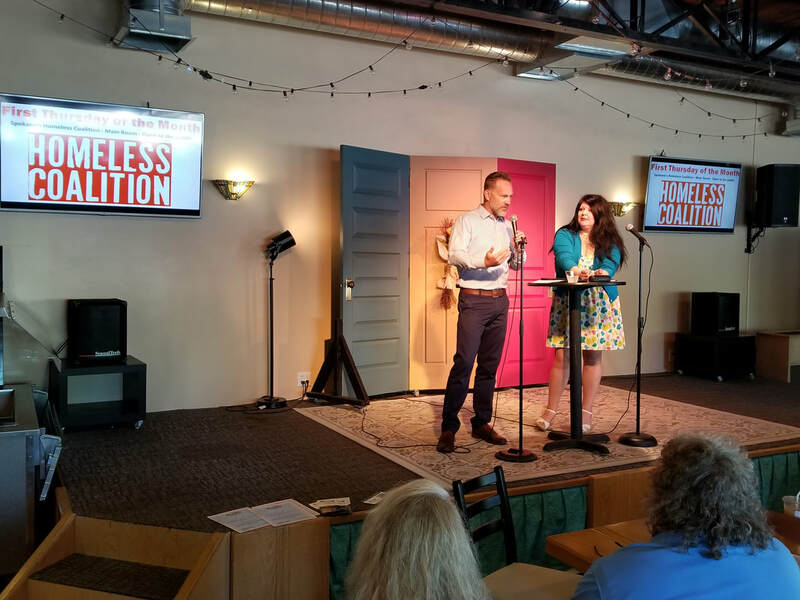 The presenters for the June Coalition meting were John Robertson, Program Manager of VOA's Crosswalk, and Edie Rice-Sauer, Executive Director of Transitions. John Robertson is the Program Manager at Volunteers of America’s Crosswalk. Crosswalk is an emergency shelter, a school drop-out prevention program, and a group of lifesaving and life-changing programs dedicated to breaking the cycle of youth homelessness. In an average year, Crosswalk serves more than 850 youth. Emergency shelter is available 365 days a year and all services are free and voluntary. 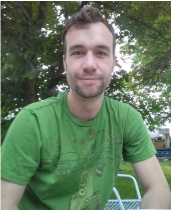 John started working in the shelter in 2009 as an overnight staff and found a passion in working with youth. He became Program Manager in 2014. Edie Rice-Sauer is the Executive Director of Transitions. Transitions’ mission is to end poverty and homelessness for women and children in Spokane. Her presentation topic will be Transitions programs, including new affordable cottages.